How to install centrifugal pump? Centrifugal pump is one of the simplest equipment in drilling mud system. Its purpose is to convert energy of an electric motor or engine into velocity or kinetic energy and then become pressure among fluid that is being pumped. The energy changes occur on two main parts of the pump, the impeller and the volute. The impeller is a rotating part that converts driver energy into the kinetic energy. The volute is a stationary part that converts the kinetic energy into pressure. 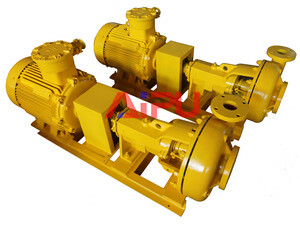 In oilfield drilling system, centrifugal pump is used to transport drilling mud, it also can be used as feeding pump for desander, desilter, or as mixing pump for jet mud mixer. Today we will learn how to correctly install a centrifugal pump. Before selecting pump, we should seriously grasp the selection method of pump specifications, speed, impeller diameter, or ask a professional expert. If without a professional check or suggestion, the impeller diameter can never be changed to avoid damage pump balance. Each centrifugal pump suction pipe should be independent particularly, the two pump export pipeline should be in parallel to avoid wasting and other problems of solids control equipment. In order to correctly choose the pump specifications, speed, diameter of impeller and motor specifications, we must confirm load capacity and design export pipeline, and then get the lift according to the required flow. Design pipe diameter size according to the required flow of solids control equipment and don’t depend on the flange specification of the centrifugal pump to design. Synthetically consider the pump speed and impeller diameter according to the application of liquid transferred by centrifugal pump. We should ensure sufficient liquid for pump sucking to prevent the whirlpool and air lock. Needn’t install bottom valve on the section pipe. Keep the motor power big enough to convey the maximum density drilling fluid under maximum flow. Every pump with a suction pipe and a discharge tube without manifold will achieve the highest efficiency. We suggest install a pressure gage between discharge pipe and the first valve. When we turn on the valve, we can diagnose pump performance through the pressure gage. If the pump works on the upper part of suction pipe, we should install a valve on the bottom of centrifugal pump when the pump is off there won’t be inhalation of drain at bottom. Correctly installing centrifugal pump can improve working efficiency and save cost. Aipu machinery will give you more information about solids control equipment.